Designed and built to comply with and exceed FDA and GMP standards and to satisfy the demands of the pharmaceutical industry regulation, Pharma GF-PRO metal detection systems provide the ultimate in fully integrated product inspection and rejection systems for fine powders. Pharma GF-PRO inspection systems utilize high frequency operation to provide the highest attainable metal detection sensitivity to all metal contaminants. Difficult to detect non-magnetic stainless steels and irregular shaped contaminants such as minute pieces of sieve wire and swarf are readily detected and rejected with ease. Exceptional performance in pharmaceutical process environments is enhanced through robust construction techniques enabling previously unseen levels of on-line stability to be attained. The compliance needs of 21 CFR part 11 are fully met through the provision of dual-level, high security log-in facilities for operators and the capture of electronic signatures and other process data. Systems incorporate advanced reject diverters to ensure any contaminated product is rapidly removed from the product flow. Pharma GF-PRO detectors utilize Profile software technology which incorporates continuous Condition Monitoring functionality to assess key component performance and to give advanced warning of adverse trends which could lead to equipment failure if left unaddressed. Early warnings can be communicated via SMS text messages or email to key operational personnel. Unrivalled sensitivity and stability The maximum capacity to detect the most challenging of all metal contaminants combined with robust, on-line stability to minimize instances of false reject events. Full 21 CFR part 11 compliance High security, dual level operator log-in facility with full electronic signature capture ensures full regulatory compliance to be met. 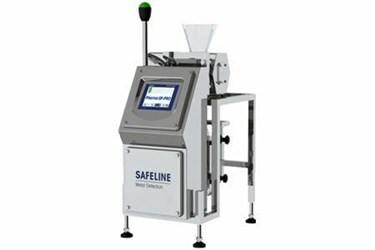 Failsafe reject system Advanced integrated reject diverter device to ensure all contaminants are effectively removed from the production flow. Hygienic, easy clean design No tools required for dismantling/assembly. Fully submersible contact parts for easy cleaning. Performance validation software Built-in performance validation software indicates when scheduled testing is due and assists QA staff by guiding them through step by step test routines. Easy to use The intuitive Profile full color touch screen operator panel provides easy set up requiring minimal operator training and reduced downtime between product changes. Pharmaceutical construction standards Designed and built in mirror finish stainless steel to comply with 21 CFR parts 210 & 211. Built-in condition monitoring Constant analysis of the detection coil and electronics systems provide advanced warning of potential problems prior to failure enabling planned maintenance routines to take place. SMS and email communications facilities Communication of key production process messages for maintenance and QA procedures maximizes uptime and manufacturing efficiency. Connectivity options Can be provided with an integral Ethernet adapter enabling connection to all external data collection devices and factory management systems.